Navratri is the celebration of the nine forms of Goddess Durga for nine nights and nine days before the festival of Dussehra. The word navaratri is a combination of two words nava meaning nine and ratri meaning night. Like any other festival in India the legends and customs revolving around the festival are different in different parts of the country. However, the sentiment is the same – to worship and give adulation to Maa Durga. The Durga Pujo from Bengal and nearby states is famous all over the world. Majestic pandals that house humungous and beautiful statues of goddess Durga are set up in every nook and corner of Kolkata. Durga Pooja is the biggest and grandest festival in the east and is celebrated extravagantly with bhajans, puja, dance and plenty of food. On the tenth day, the idols are immersed in water bodies with a promise of bringing them back next year. The celebrations in the west revolve more around dance and music. People look forward to the arrival of Navratri when the nine evenings are filled with song and dance which goes on well past midnight. Dandiya raas is performed in the honour of Goddess Durga. Did you know that the dance is actually a dramatization of a mock fight between the Goddess and Mahishasura. The colourful bamboo sticks used during the dance represent the sword of Durga. Men and women dressed up to the nines in traditional ghaghra cholis and kediyus dancing with gusto is a common sight across Gujarat and Mumbai. Navratri is celebrated twice a year – once in the beginning of summer and the second time in the beginning of winter. Because these are two important occasions when the climatic changes and solar power influence mankind and therefore, are ideal for worship of the divine power. It is this very divine power that provides the earth the energy to move around the sun which causes the changes in the nature, yet maintain a correct balance. Furthermore, these changes in the nature make the bodies and minds of people to change and the divine power helps to maintain our physical and mental balance. The fasts that we keep during the navratras are a great way to maintain balance of the elements in our body. Everybody has different ways of doing their fast and different customs and traditions. While some consume only milk and fruits during these days some people eat one satvik meal a day. My mother used to keep a fast during navratra, which, for us, meant getting to eat some very different type of food which would not be prepared during the rest of the year. Things like kootu ke atte ki puri, rajgira rotis, sabudana and aloo ke wade, sweet potato fritters with black salt, dry fruit laddoos and other such farhali recipes were made. We also attended several pujas and satsangs organized in the area, a habit that we continue till date as a family. As a matter of fact even my kids love visiting the Durga Puja pandals. The singing of bhajans and listening to the tales and legends of Maa Durga is one of my favourite parts of this festival. Let go off all the negativity and vices in your life. Letting go of things isn’t easy and it does require a lot of strength. Durga maa is also known as shakti and is symbolized by a lion. Let go off your old habits and forgive those who may have wronged you. Acceptance has always been difficult for mankind. Santoshi maa teaches us the power to accept. Like in a bowl of rice – full of grains, separate yet together, every person is different from the other, yet we must accept them as they are and treat everyone as equals without putting forth any conditions. She teaches us to differentiate between good and bad, right and wrong and to discriminate. The spinning chakra behind her head symbolizes self-realization. The conch shell that she has teaches us that the right words must be spoken at the right time. The swan she sits on symbolizes love. Saraswati maa is the goddess of knowledge and music. The sitar in her hand tells you to create your own music, the scriptures she holds depict accurate decisions. Anyone with knowledge can create his/her own music. The rosary or the jaap mala tells us that decisions are independent, but should be made keeping others in mind. She is fearless and teaches us that once we overcome our fears, including the fear of death, we can face any situation and perform our actions with more conviction. We don’t need to face people but overcome our own weakness instead. Don’t accept weakness, kill that demon. She teaches us to cooperate with others instead of competing with them. The lotus that she sits on symbolizes how it’s possible to be pure even amidst muck. The gold coins that she drops from her hands signify detachment. The more you give the more you get. She teaches us to give without any expectations. We spend nine months in our mother’s womb and during navratra it is time to go back to the source and imbibe all the qualities in our core personalities. Eat and drink with restraints to purify and rebuild the balance and maintain harmony of the mind, body and soul. While you’ll are busy celebrating this festival don’t forget to share your recipes and any food experiences with me. 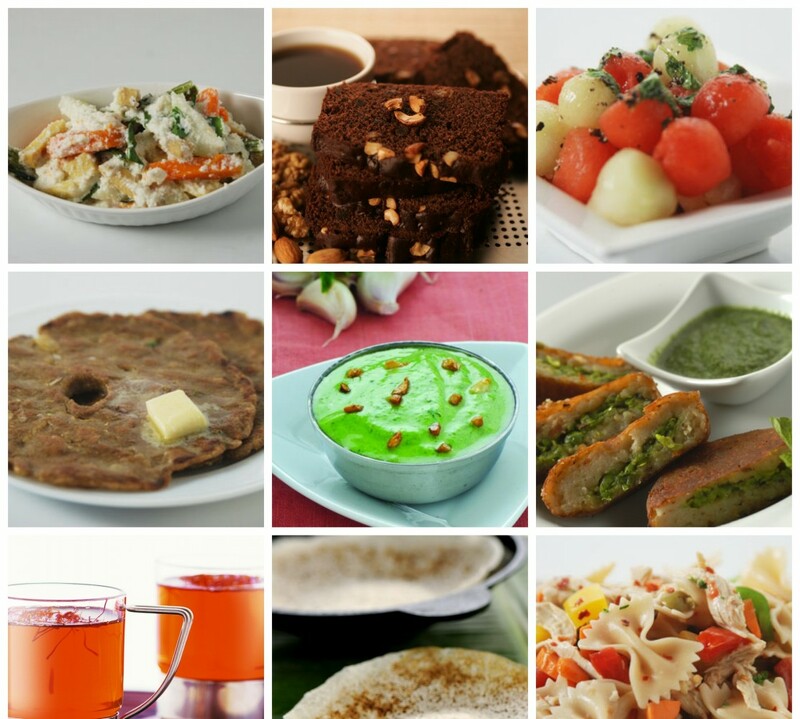 Try some of these recipes that are made especially in West Bengal during the puja days.